The language in this video from Australia is a little off-color at times, but the information is solid. The message: Putting nitrogen in your tires is a waste of money. Watch the 17-minute video. Important consideration if changing tire size: "Minimum Dual Spacing"
Knowing about the extra details of dual tire application is not anything car drivers were ever called upon to know. When you joined the RV world your first RVs were probably trailers and you don't have to know about special considerations with duals. If you now own a motorhome that has two tires on each end of the rear axle, then you have "duals" and need to know and consider some new information. I have written a number of posts on this topic and I suggest you take a look at each post by clicking on the word "dual" on the list to the left. If you are considering changing tire size on your motorhome, there are a number of items you need to consider. I have previously covered the importance of matching tire OD if only changing one tire of a pair of duals. While you may remember reading that POST, you may be telling yourself that you don't need to worry about the matching dimension if you are changing all your tires. While you may understand the need to pay attention to load capacity and the physical dimensions of the tires themselves, there is also a CRITICAL dimension that you can't measure with a tape measure and that is called "Minimum Dual Spacing". You may or may not have noticed this dimension when looking at a table with tire dimensions. Not all tables have this dimension but it is very critical. I have highlighted the Min Dual Spacing information and the rim width dimension which is also critical. It is important to remember that not all tires are approved for a specific rim width when looking at the upper range of load capacity. Tires in a side-by-side, i.e., dual position MUST have a certain amount of clearance between them or the tire-to-tire contact of the sidewall may lead to failure of BOTH tires. Going from a 255 to 275 wide tire will probably mean you will not have the specified clearance unless you also change wheels. Only way to know is to check the wheel specifications from the manufacturer. Here is what that dimension means. It is the distance from the center of one tire to the center of its mate, when mounted on the actual wheels you will be using. Now there is no single place you can make this measurement on a wheel as it requires calculation, as the mounting surface of the inner dual wheel is not the same surface as the mounting surface of the outer wheel. Tire charts and dealers can tell you the minimum dimension needed as seen above but you need information from the wheel manufacturer to learn the dimension from the mounting surfaces to the wheel center-line. So, along with load capacity, OD and tire width you also need to confirm your wheel width meets the tire specification as well as calculate the dual spacing from the dimensions provided for your wheels. Special warning. I know that some motorhomes have steel inner wheels and aluminum outers for the dual position. You will quickly learn that the offset spacing is different for steel vs aluminum. The general guidelines for motorhomes is to have the tire inspected starting at about 5 years and to replace at 10 years no matter what the inspection indicates. Due to the Interply Shear effects on belt durability, trailer tires need to be closely inspected after a couple of years and it appears that 5 years may be the max life for most applications. I do understand that people would like a nice clear precise answer but the problem is that with load, speed and temperatures all having an impact on the life of a tire it is impossible to give a precise time of when to replace a tire. In today's society no company can give a specific answer to the question as they would be sued if a tire failed before the "end of life" time and they would be sued if the tire lasted past the "end of life" time. We are talking about probability. You have a sticker on your RV telling you the inflation to use based on an estimate of how much "stuff" you will be carrying. Federal Regulations say the tire load capacity at the specified inflation must be able to support the load rating of the axle. This assumes an exact 50/50 side-to-side load split all the time. It also assumes you do not put more or less load in your RV than what would result in each axle being exactly at GAWR. Many have learned of the importance of getting the actual load on each tire. Maybe it would help if we thought about tread depth instead of age. Exactly how much tread can be worn off before a tire becomes "unsafe'. Most states say 2/32" for passenger car tires but does that mean the tire with 3/32" tread will always perform equally to a tire with 10/32"? Of course not. As the tread wears the wet traction capability goes down. Do you always wait till each tire gets to 2/32" before replacing it? If not, why not? Conversely the dry traction can go up as tread depth goes down, so there is a trade-off. I dare say that if you live is an area with lots of rain or even snow, you probably change tires before they are that worn. However, if you live in the dry Southwest you may be tempted to run less than 2/32" tread as you have seldom if ever have wet traction problems. Why aren't there more recalls of bad RV tires? In addition to writing this blog, I monitor a number of different RV forums for discussions on tires and related issues. I find that many times I am suggesting to people that they should file a complaint with National Highway Traffic Safety Administration about their tire problems. Many times I get replies asking "Why Bother". While this post focuses on trailer tires the information also applies to other RV applications. "I get tired of hearing that most ST tire problems are caused by the RV owner. I simply don't believe it based on my own experience. NHTSA; never heard of them, much less knew I could file a complaint. So I asked my tire dealer. She said that they do turn in reports on tire problems themselves and/or turn the tires over to their tire reps for analysis. That went for tires they sold or other brands they replaced. So I don't believe the argument that NHTSA doesn't have enough data to see a trend for ST China bombs. Doesn't make sense if tire dealers are turning in info to them to protect their sales and customers." Scott I have a number of posts on NHTSA. Here is my take on recalls and filing complaints. They have a limited budget so must focus on most important first. That means things that can result in death or personal injury. TT only see financial loss so obviously would come last. While your dealer may have sent information to the tire importer I have noted that many times the volume of tires in a "family" may be low enough to avoid the requirement for data be sent to NHTSA. So if you were NHTSA where would you spend your research tax dollars? On the quality of 254 Mil tires where there might be injury or on the quality of 7 mil tires with almost no chance of injury? There have been a few recalls on ST type tires but I am also aware of times when ST tires are not recalled simply because the records are poor as most are imports. In some cases the importer is a small company so does not have the money to do a recall that can cost many million dollars even for a small recall. IMO sometimes a small company would simply go out of business rather than try and handle a large recall. The RV owners seldom file complaints and many times when they do they do not include the DOT serial so that complaint can not be used in the tally of number of complaints. Tireman, this seems to me to be a big picture economics issue. Is it true that the auto and truck industry does not experience the failure rate or short life that the ST tires experience? If true then the RV tire industry and rv chassis mfgs apparently are not willing to manufacture to the same expectations of the auto industry leading to all the woes that we experience. Look in any parking lot and many of the cars are running on poorly inflated tires. My guess is that these do not fail at the same rate as ST tires. I also have an engineering/QA background and have abused tires for 50 years in racing, towing and with heavy Ag equipment and never seen the failure issues we see with ST tires. I do properly maintain and store my tires, even so I have had 3 failures out of 8 tires in the last three years. Anecdotally I also travel enough to see too many RV trailers on the side of the road with failures. If not for economics, why would ST tires only be made to be rated at 65 mph when we live in a faster world? I try to stay under this for fuel economy but find myself at higher speeds frequently. Impossible to practically operate within rated limits. Is this whole issue because RV mfg do not want to pass on the cost of safe tires? I understand Motorhome tire life is 5 to 7 years and tractor trailer operators get hundreds of thousands of miles on tires. ST tires 2 years? Please explain. IMO the main reason RV TT mfg do not provide better tire fitment (load capacity) is they sell based on "Bling at low cost". When shopping the RV market you will almost never meet a salesperson who tries to sell based on specifications. Yes tires applied to TT are designed to meet 1970 driving speeds (55 mph speed limit) IMO RV Industry lobby actively opposes any change in requirements that might increase costs by even a few dollars. Yes ST tire life is MUCH shorter than Passenger, LT or Truck tires. 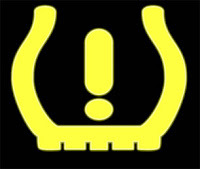 Universal use of TPMS starting in 2005 on passenger cars has significantly lowered tire failure rates on cars but RVIA (mfg association) does not support TPMS as OE on RVs is one example. They also do not support applying 2002 DOT test requirements on ST type tires so you are stuck with 1970 performance in the 2016 world. You could write to RVIA at info@GoRVing.com but I have been told that as an industry representative organization they may not be very interested in individual complaints. If you want to learn more, read some of my posts about NHTSA. PS While I have done training at NHTSA in Washington DC I do not work for DOT or any Gov agency. Can you "contain" a tire failure ? Sorry, but IMO trying to "build a shield" just is not a reasonable approach. I doubt that you can spare the 500 or more pounds of steel it would take for the shield and structure to support the shield. Since a failure of a tire can be explosive event a solid wall will not let the force dissipate. You need an open grate. Check out this compilation of exploding tires to see the forces involved. Note that most of these did not involve a tire spinning at 50 to 65 mph which would add significant force to any explosion. You need to remember that tires simply do not fail catastrophically without some reason. There is no magic involved. 1. It can fail in the sidewall if it is run at highway speeds (30+) while significantly under-inflated ( 40 to 80% low). Polyester melts. Steel tires do not need the speed but steel fatigues so after maybe a couple thousand cycles you get a "zipper" failure. Properly functioning TPMS can warn of the air loss in the first couple seconds of a loss ( of just a few psi for some brands). In most cases this early warning will come way before the tire has lost enough air to result in steel fatigue or body cord melting. If you have a TPMS have you tested it? Can you hear the buzzer over the loud radio? 2. Radials can have a belt/tread separation. This takes many hundreds or even thousands of miles to grow large enough for the tire to come apart. This is where the close inspection in my blog post comes in. As I showed a tire with even significant separation does not have to come apart at once but it does leave visible clues. The reason for belt separation is a combination of initial tire design and material selection and the long term use. Initial design can not prevent all damage done through excess heat and age but current technology in first class radials should deliver 5-6 years or 30 to 60,000 miles at specified inflation and a max of 80% load, except for multi axle trailers. Due to trailer suspension design there are unique forces "Interply Shear" placed on TT tires that result is about 24% higher shear forces than seen in motorized vehicles. This means you would need to run very much decreased load ( maybe -25% to -50%) to get the same life on a TT application than the same tire on a TV application. I do not know of any direct comparison real life testing so can only guess at the above figures other than the 24% that comes from Finite Element computer simulation that is a well developed tool in automotive circles other than the RV industry. Rubber strength degrades with time and heat with HEAT being an over-riding contributor. Do you cover your tires with white covers? This can result is a very significant lowering of tire temperature. Every hour of full sun exposure can be equivalent to two to 3 hours of use running down the highway at top speed. Quick example: 8 hours a day 7 days a week for two months each summer can be the equivalent of 10,000 miles use as far as rubber degradation is concerned. So if we assume a tire is good for 40,000 miles and you park it as in the above example after 3 years you may have "consumed the equivalent of 30.000 mile tire life, just while parked. IMO making some effort to prevent a failure in the first place (TPMS & frequent inspection) would be a better use of time and money than trying to prevent damage to the RV with some sort of shield. Unhappy with the quality of the tires on your RV? "ST tires may be approved by government regulatory agencies. They still have a 3 year life. When I had tread separations, documenting the event for a government agency was not my focus. Getting new tires and going camping was my focus." First off, there is no government agency that is "approving" tires. The DOT does publish performance regulations that the tire company is "certifying" all the tires they make are capable of passing the requirements. If a tire company wants to game the system and make tires that do not meet the regulations there is no way for the DOT to learn this unless they conduct an investigation. The DOT will not start an investigation without justification or they could be accused of wasting taxpayer money. A major part of that justification is the number of complaints on file. No actionable complaint => No Investigation => No findings of low quality => No recall => No improvement in quality of ST tires. IMO there are some in the business of low cost tire production and sales who know the average RV owner will never complain. They are playing the odds that there will never be a recall, so with no future penalty there is no incentive to improve quality. Even if you can't focus on filing a complaint at the time of the failure you certainly could file it a few days later, but that would mean you had made the initial effort to record the S/N for your tires. If RV owners can't make that minimal effort of recording the S/N and spend the few minutes it takes to file a complaint, I simply do not understand why they feel they can take the moral high ground and complain about poor tire quality. Filing a complaint only takes a couple of minutes. Maybe less time than what many are willing to spend complaining on an RV forum. Have you recorded the DOT S/N for your tires? Another post on Cold Inflation Pressure and "Ambient" temperature. Some clarification from a tire engineer. First off, I am not going to address what the correct Cold Inflation Pressure ("CIP") is for your RV. We will assume you have read my other posts on how to learn that number. If you haven't, simply look at the list of labels on the left side of this blog and you can review them. 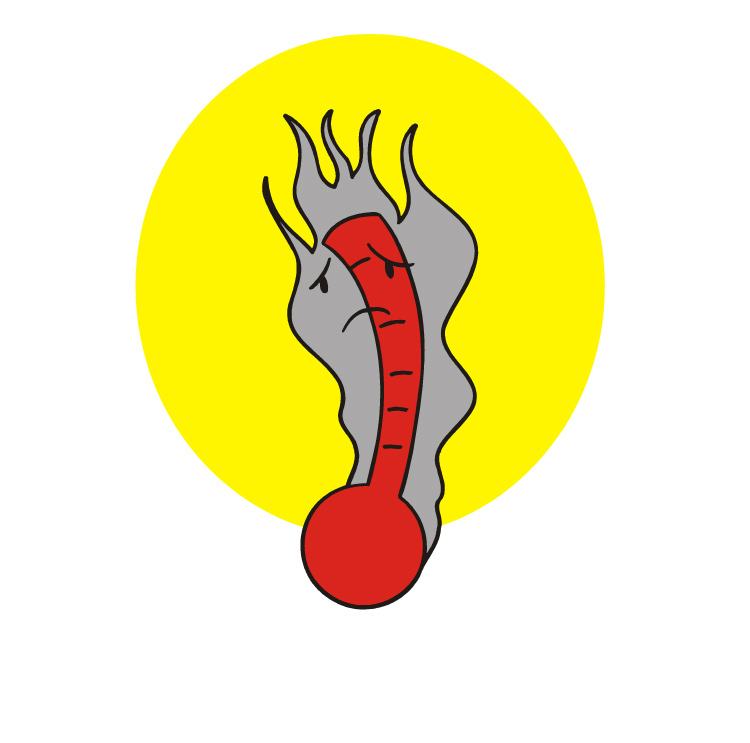 Some people want to refer to a Temperature compensation chart. Tire Rack was off a bit till they updated their tech page last year after my input. Also Wikipedia definition for Cold Inflation Pressure was also almost correct till I added a clarification aimed at RV owners. The 1 Psi for 10 F is OK if your base inflation is near 40 psi but many RVs use 80 to 110 psi. The correct "Rule of Thumb" to use is 2% for each 10F. Tire pressure is not based on any laboratory standard temperature (some claim 70 F) but is based on the tire not being warmed from either use, i.e. being driven in previous two hours, or from being in the Sun for previous two hours. Even partial sun can affect the reading. Classical "Temperature in the Shade" is the "Ambient" tire engineers are talking about. Not temperature in a theoretical laboratory. So regarding a situation of setting the pressure when the tires and air is 50 F. That would be fine and we would expect the pressure to increase by about 8% if the Ambient increased to 90 F even without driving or Sun exposure. It is correct to say, "The ONLY time to check CIP is FIRST thing in the morning BEFORE the day's temp has had a chance to increase and BEFORE the sun has had a chance to shine on the tires and BEFORE you have used the vehicle." However, if you are driving from the campground on top of Pike's Peak and stop for lunch for two hours in the shade in Flagstaff where it is 90 and check your air, you might find a change of a few psi. You could adjust your pressure before continuing to Phoenix, where it is 120 F, but I don't bother to adjust inflation by the 1 to 3 psi variation I observe day to day. In my mind that is too much work. NOTE: My personal CIP is 75/80 F/R on my Class-C MH. Both of these pressures are more than 10% above the minimum pressure needed to support the measured load on each tire so I have a "cushion". I usually wait till I am home and am getting ready for the next trip before I adjust my inflation to my personal CIP, so I simply monitor the running inflation pressure which goes up and down as ambient temperature, driving and Sun exposure changes the inflation. My TPMS will warn me of air loss, so all is good as I motor down the highway. When considering a change in tire size there are many different areas you should consider. Tire load capacity. You need to be sure you go with tires that have equal or greater load capacity than original. It is possible that the original tires delivered a very small load capacity such that the coach is easily overloaded. Recalls may have been ordered or initiated but sometimes a manufacturer went bankrupt so no recall action took place or no new tire certification label was provided. So it is up to you, the current owner to do your homework and get the facts. - You need to learn the real load capability of the axle by contacting the manufacturer if there is no plate on the axle with GAWR info. - You also need to learn the real loads you are placing on your tires with your coach fully loaded. Here is a worksheet with instructions on the steps and calculations you need to do. Now load capacity is not the only information you need. You also have to be sure the tire will never rub and contact any portion of the coach or its suspension. part of this is obvious and can be discovered by rolling on your back with a flashlight to confirm sufficient clearance around all your tires. Don't forget to check both front tires with wheels turned completely both directions. I have read that 3" on all sides is a reasonable clearance. One final clearance check that is sometimes overlooked is the clearance between dual tires. This requires more than just looking at the rear tires. In tire company specification charts there will be a dimension called "Minimum Dual Spacing" for the tires you may be considering. This dimension is controlled by the wheels. Sometimes this information may be marked on the wheel but most likely you will need to contact the wheel manufacturer to learn the specification. This is CRITICAL, as too small a clearance can result in tire damage or even failure. I can't address if a specific size will fit but simply going up one size would be reasonably close to the 1/2" width increase. Now it is important to remember that tire dimensions are approximate and if you change brands the actual with may be a little different. Also don't forget that the OD would also increase which means the clearance between the tread and wheel well or the companion tire would change also. You should be able to find published OD and width dimensions from your tire companies web page. But in some cases on older coaches tires may have been changed in size or even the size designation such as an old 7.50-15. If you find yourself in that situation you might consider dropping me an email so I can help walk you through the things you need to consider. RE Speed Ratings and operation speed. My comparison to engine redline seems to me to be the easiest for many to understand. It is possible to run an engine right at redline or even above for a short time but I can't find anyone that advocates operating an engine at the rated max speed for any significant time or distance. High Speed test is not a DOT regulatory test but is a test based on Society of Automotive Engineers testing. To be marked with a speed symbol a new tire needs to run for 30 minutes on a smooth drum at the stated speed. There is no requirement for a tire to be "conditioned" with a few thousand miles at lower speed over potholes and up on curbs or with 110% of the rated load or for the tire to be able to pass DOT regulatory durability tests after running the SAE High Speed test. Yes, an increasing number of ST type tires now come with a speed symbol molded on the sidewall. The primary reason for this seems to be to avoid import duties. What many want to ignore is the fundamental truth that the load capacity of ST tires is much higher than an LT type tire based on the premise from 1970 that the ST tire would be on a single axle trailer that was limited to 50 mph operation speed. Molding the letters "ST" on a tire is not magic. Physics still applies. If people want to drive at 75 or 80 while towing as they would with their LT type tires and not have failures, then I suggest they pay attention to the Physics and limit the actual tire load as if it were an LT type. This is easy to do. First simply look for an LT type tire with the same dimensions i.e. ST235/75R15 > LT235/75R15 in the Load tables and limit their measured load to the number found in the LT tables. If you do that you will probably see a significant reduction in tire failures. Of course this also means you are not in the 50+% of RV owners that operate your tires under-inflated. If you ignore the Facts and Physics of reality you will have to live with the consequences no matter how much you want to believe otherwise. Bottom Line. If you want durability and life more like LY type tires then treat them as if they were LT type tires. As with the engine in your RV or tow vehicle it may be possible to run faster but it does not mean you will avoid all problems. This post is just about tires and not about safe and reasonable operation of your RV. Personally I think 70 is too fast to drive a "big rig" and 75 is certainly too fast for towing. I have heard comments about an increase in truck tire failures due to increased speed limits in many states. A MAX of 75 is stated in some tire information guides published by major tire companies and as with any maximum, the closer you are to it the more likely you will have some negative consequences. "Tireman, your concerns over shear puzzle me. G614s are LT tires as are the tires on my 2500 pickup. Only difference is G rated vs E rated. The truck mfg recommends 60 front 75 rear with 80 psi max on sidewall. Why is there no concern about shear on the front tires of my truck. It seems to me the frequency of shear forces is much greater on the truck than the trailer." But the reality is that when computer analysis is used to look at the internal structural loading, the fact that tow vehicle tires are all operating at very low "slip angle" (difference between travel direction and angle the tires are pointed to) is significantly lower than for tires on a trailer. The reason for this is that the center line of of tire rotation for the tow vehicle tires points to the center of the radius while the trailer tires, especially on tandem axle trailers, does not. This translates into a higher slip angle which means higher internal structural twisting forces on the belts. The computer model suggests 24% higher on the TT tires than TV tires even if all tires were the same with identical vertical load and inflation. TV front tires have "Ackermann" alignment designed into the suspension but TT have no allowance other than bending of tires, springs, spring mounts and bushings but the forces to bend the springs etc have to go through the belts of the tires. This is a MAJOR reason for travel trailer tire life to be much shorter than motorhome or tow vehicle tire life. Hope this helps folks understand a bit of what makes tire engineering a challenge. Editor: Here is an earlier article Roger wrote about "interply shear," if you want more information. I see the term "Dry Rot" used by many in the RV community when describing old tires that have visible external cracks. Some have attributed this to the dry air in the Southwest part of the US. Some with specific references to Arizona. Sidewall cracking occurs for a number of different reasons but these reasons all end up at the same place. The elastic properties of the rubber have been degraded over time and when the rubber is flexed it cracks rather than stretches. Some reasons for the loss of flexibility or "stretchyness" can include exposure to UV or Ozone or simply old age. Each of these items is different but they each attack the bonds that exist between the various materials such as rubber, sulfur, carbon black, oils waxes and numerous trace materials used in the process of manufacturing rubber. When the chemical bonds break or "crack" the loads in the rubber get transferred to the nearby material which then has to resist the forces trying to stretch it. These cracks may start out at the molecular level but they do not repair themselves so they can only continue to grow. Eventually they are large enough to be seen on the outside of the tire and if the tire is exposed to the damaging elements long enough the cracks can grow large enough to allow air to escape or for tire components separate. I have previously discussed the way increased heat can actually accelerate the aging process of rubber in posts about direct exposure to sunlight and that the use of white tire covers can reduce the accelerated aging process. For those interested HERE is a report issued by NHTSA on tire aging. You will note that on page 3 of the report titled "Background" they identify that "degradation is accelerated with higher temperatures", You may also note that there is no mention of UV as a significant contributor to the aging process. IMO Sidewall cracking is in itself seldom more than a cosmetic issue. However it can be an indicator of possible "old age" and degradation of the internal structure of a tire. Maybe a good analogy is when you run a temperature. I do not recall ever hearing of someone having a temperature for no reason. 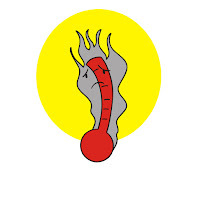 Your elevated temperature is almost always an indication or symptom of some other medical problem that needs attention. Since the consumer has no good, low cost way to learn the condition of the tire structure you are confined to looking at various symptoms. Spotty tread wear is one symptom. Tread and/or sidewall snaking is another and of course sidewall cracking can be another. Tires do not actually suffer from "rot" as one might see in a piece of wood or some old food. They can have signs of surface cracking but as long as the cracks are shallow and a tire dealer has completed a full inspection of a tire and said it was okay to run I would go with the dealer finding. You might want to review my post on How do I inspect my tires and note that signs other than just cracking can be much more telling than just sidewall cracking. 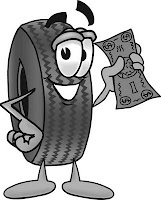 Most informed folks in the RV community know that our tires will normally "age-out" before they "wear-out" so they are confronted with spending a bunch of money on new tires and sometimes even being charged by the dealer to take the old tires. Now obviously this truck is used for local short haul service with probably a lot of relatively sharp turns in and out of driveways that result in rapid tread wear and a good portion of the time at less than max load. Just something to consider when confronted with the question of what to do with your old tires. IMO there is a good chance companies like this might be interested for the right price. Which brand tire is better ? I can setup a test if you really want the answer. Many people ask the question in various RV forums "I need new tires. What is the best brand tire I can get?" or "Why do tires made by company Q seem to have a high a failure rate?" Invariably the thread quickly devolves into people providing their opinion but I do not recall ever seen the suggestion that one brand is better than another supported with any data based on direct apples to apples comparison of two brands of tires. I believe there are two reasons for not getting a clear picture of which tires provide better service in RV application: One reason is personal pride and the other is a lack of direct comparison based on equivalent exposure to service problems. I think you will find that many posts IMO are based on the concept that people do not want to consider the possibility that the product they bought isn't the best. To think so could be an indication that someone might not be making the best purchasing decisions. For example, if someone asks about Acme brand anvils, and someone just happened to have purchased an Acme anvil they are more than willing to "badmouth" anvils made by almost any competitor even when they lack either meaningful data or solid experience to justify their position. After all why would they admit to just having purchased a good quality anvil? Direct comparison of tire performance. You may not be interested in ST type tire but I would hope that if you review this information it may help you make a more informed decision when asking what brand to buy. If you consider that the OE market in ST type tires in RV trailer application is dominated by Goodyear and many dozen 3rd or 4th tier tire companies who make tires in small lots and don't even apply the name of the tire company to the tires they are making. With GY having a majority of the market and no other brand having much more than 5% I think you can see how it easy to end up with skewed impression that GY tires are bad, based simply on the observation that the greatest number of complaints are about Goodyear ST type tires. This is much like the concept that tires made in China must be poor quality because so many trailer owners that have problems with their tires discover they are made in China. I have to wonder how people expect to be able to make a reasonable comparison of tire quality based on country of origin when probably 90+% of RV trailers with ST type tires come OE with tires made in China. Wouldn't it seem reasonable then that 90+% of problems experienced on RV trailers with ST type tires would have tires that were made in China? Now in 22.5 rim diameter tires found on Class-A RVs, I think we see Michelins with sidewall cracking complaints and Goodyears with irregular wear complaints and since those two companies probably are on 70+% of coaches of course those are the ones that would have the most and therefore most noticeable complaints. Even if another company with maybe 5% of the market had tire failures at twice the rate of GY or MI cosmetic issues, it would still appear that GY and MI are the only tires with problems. Check out my post on Causation vs Correlation for more on the topic. Thorough tire testing costs in the neighborhood of $30k to over $100k per brand for just basic outdoor wear and general durability is it any wonder that no independent agency has stepped up and run such a comparison? Now I have the contacts in the tire industry to an independent testing company that could run such a comparison. All I need is for people to send me contributions - maybe in $500 increments and I will develop the specifications for a direct comparison between Goodyear ST type tires and Maxxis brand ST type tires plus a set of TowMax or similar ST type tires. I would use a popular size and load range made by all three companies. To keep costs down we would limit the test duration to about 10,000 miles or till there are enough failures to discontinue running that brand. I figure two failures would be enough to stop running a given brand. So do you really want to see actual data? All I need is $35,000 in the bank to start the evaluation. Test results would be sent only to those making the minimum $350 contribution or more. If interested send me an email and I can send you specific details of this offer. We only need 100 individual contributions to get started. While responding to an RV forum question on tire performance for Class-A size tires, I found a potentially very useful web site for those in the market for new tires for Class-A RVs i.e. 22.5" sizes. The EPA has a program called SmartWay that many may not be aware of. This program identifies tires that can provide better fuel economy than tires not on the list. Here is the web site with the tire brand and design name of tires that are certified as meeting the minimum requirements of this regulation. Being on this list vs not being on the list is about the only tool available to tire owners to compare tires where claims have been made about improved fuel economy. If you are new to the RV lifestyle or an old hand with many thousand campfires under your belt, there is one thing that is true: What you knew or learned about tires from years of car ownership probably did not prepare you for the task of maintaining the tires on your RV. This is true if your RV is a 18’ Travel Trailer or a 45’ Diesel Pusher. I think we all understand the concept that a system is no stronger than its weakest link. For many RVs, the weakest link that can interrupt long term, problem free travel are the tires. Car tires have evolved with improved durability and reliability to the point that many people may never need to touch their tires or even know how to change a tire. Today, some cars don’t even have a spare tire and if they do the driver may not have even bothered to learn where it is as the expectation of needing to use the spare is so low it has completely dropped off the radar screen. As a retired Tire Engineer with 40 years experience in design, evaluation and quality assurance of tires I would like to offer some suggestions that I believe if followed, will lead to many years of problem free travel. I also believe that once you take the initial steps I outline, you will also find that you will only need to spend about 15 minutes a month, or less on average with tire maintenance. 2. Ensuring your tires are always inflated to that level. There it is, just two simple and rather basic steps and, you don’t need to be experienced in vehicle mechanics or tire engineering to accomplish these two steps as I am going to share the steps that have worked for me and thousands of others for decades. So the first step is to know the proper level of tire inflation on your personal RV. The important concept here is “Your RV”. Not the RV your brother-in law uses, or the inflation the guy in the campsite next to you uses, or even the level provided by the RV manufacturer on the tire certification label, otherwise know as the “Tire Placard”. Now some will point out that the RV manufacturer has the responsibility to inform you of the minimum tire inflation you should use, and this is correct, but this is based on an assumption which may mean the numbers are too high or too low for your RV when you have it packed with the stuff you want to take along on your next trip. This step takes the most effort, but you really only need to do it once over the years you own your RV – unless you make a major change such as add a generator or refinish the interior with granite counter tops; you know, do something that significantly changes the weight of the RV. To learn your real weight you need to pack your RV with all the clothes, food, fuel, water and other “stuff” you expect to carry, including the proverbial "bowling ball collection." Once it is fully loaded, you and the family need to take a short trip to a local feed store or gravel pit or truck stop that has a large truck scale with enough side clearance that will allow you to get the tires from just one side of the RV on the scale. Obviously you will need to do a bit of preparation to find such a scale, so some time on the Internet or with a phone book is in order. It is suggested that you review the worksheet before heading off to the scale so you get all the facts you need in one trip. Here is a company that travels the US and specializes in properly weighing RVs and giving the owner the load numbers for their personal unit. " RV Safety & Education Foundation (RVSEF) This leader in safety education in the RV community offers wheel by wheel RV weighing services for all types of RVs. If you will not be in one of the locations where RVSEF is offering their services then you will need to do a little research, as not all truck scales have the side clearance needed. You should know that some truck scale operators discourage side to side weights and have installed guard rail to prevent this. When you check out the work sheet you will have a better understanding of what is needed. Our friends at Fifthwheel St have a web site has information including a video that focuses on trailers but has video showing the process which is similar for motorhomes. If you look at more than one of the above links I think you will see that everyone offers the same basic information on the process. You do not need to worry about which worksheet you use as the math is the same for everyone. After you complete your worksheet you should know the actual load on each tire position. The next step is much easier and also only needs to be done once. You need to confirm the minimum cold inflation your tires need to carry the load. It is always a good idea to use the tables published by your brand tire. Here is my blog page with links to many different brand tires. Simply go to your brand, find the table that has your size tire and look for the inflation that supports your load or more. Don't worry if your brand doesn't offer tables as almost all companies follow the same published industry standards. Also don’t be tempted to go to a lower level of inflation if your numbers are close. Always go up. Now you know the minimum Cold Inflation Pressure or CIP. Wait! What do I mean by CIP? Whenever tire inflation pressure is measured or set the tire needs to be cool and at the same temperature of the air and in the shade. This means not having been driven on or in direct sunlight for at least 2 to 3 hours. Tires get warm when moving and the Sun heats them up which results in a higher temperature which results in artificial increase in pressure. Many people simply do their tire pressure check in the morning before starting out or late evening after a day of travel. Either way the tire needs to be cool and in the shade when you check your pressure. I feel the CIP needs to above the minimum needed to carry the load as if there is a drop in temperature you may end up below the minimum if you cut things too close. I suggest you run +10% above the Minimum for your personal CIP. All tires on each axle should have the same inflation. This means that whatever inflation numbers you have for your tires select the highest from the tires on any one axle and use that number for all tires on that axle. This will give you more uniform stopping and steering response. Over the past few years technology has evolved that allows you to monitor your tire inflation as you drive down the road and can warn you if you pick up a nail or other damage. You have this in your car and it is that little orange symbol with the exclamation point in it. and now you can add this safety feature to your RV trailer or motorhome. It is called a Tire Pressure Monitor System or TPMS for short. A quick internet search will identify a number of units specifically designed for RV application or you can review THIS web site for a discussion of features to consider when shopping for a TPMS. A bit of Truth in Advertising here. This blog is currently sponsored by Tire Traker brand TPMS. As you might expect that is the brand I have run for years. What you may not know is that I bought my TPMS from Traker before I started writing this blog. One nice feature of having such a system is you do not need to get out with your digital pressure gauge and check your tires every day of travel as the TPMS will let you know your inflation in the morning while you stay inside with your coffee and more importantly while going down the road. You will quickly learn the details of your pressure reading in just a few days of observation. So there you have it. Get the RV weighed when fully loaded and do the calculations using the worksheet to learn the actual tire loading and the inflation your tires need. This step is much more straightforward. Just check your tire pressure every travel day, or better yet get and use a TPMS (Tire Pressure Monitoring System) to constantly monitor your tire pressure. I even set my low pressure alarm level so I would get a warning before the pressure drops below the minimum inflation I need to support the measured load on my RV. I believe that if you follow this advice you should reduce what otherwise might be a less than 5% chance of having a tire failure to less than ½% chance of tire failure.